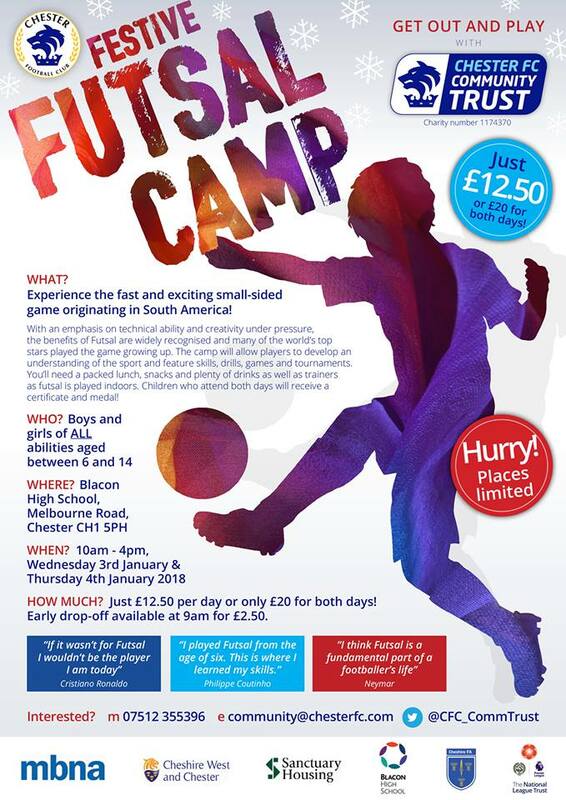 Chester FC Community Trust is running a two-day Festive Futsal Camp during the Christmas and New Year holidays. The Chester FC Festive Futsal Camp allow players to develop an understanding of the sport and feature skills, drills, games and tournaments, and will take place on Wednesday January 3rd and Thursday January 4th at Blacon High School. The camp is for children aged 6-14 and runs from 10am until 4pm each day with an optional 9am early drop-off available for parents. Places are limited and can now be booked via community@chesterfc.com, on 07872 461654 or online via Eventbrite for a small additional booking fee at community.chesterfc.com/book-online. Chester FC Community Trust can now be found on JustGiving, the world’s leading online fundraising platform. We are a registered charity (number 1174370) using the power of sport and appeal of Chester FC to improve and enhance the lives of people living in Chester through high quality football and physical activity, education programmes, social inclusion provision, and health & well-being projects. We deliver a diverse range of activities and initiatives for people of all ages and engage with hundreds of participants every month, but we want to do more and have an even greater impact on our community. You can help us to achieve this through making a donation to our JustGiving account. You can make a one-off donation, set up a monthly direct debit or if you’re considering taking part in, or hosting, a fundraising event you can nominate Chester FC Community Trust as your chosen charity. If you are a UK taxpayer, we can claim Gift Aid on eligible donations too, meaning we receive an extra 25p for every £1 donated. Every penny raised will make a huge difference and enable us to engage with more people, create new opportunities and have a lasting positive impact on the lives of the people we work with. For more information visit our JustGiving page at www.justgiving.com/chester-fc, click on the button below or contact us via community@chesterfc.com. 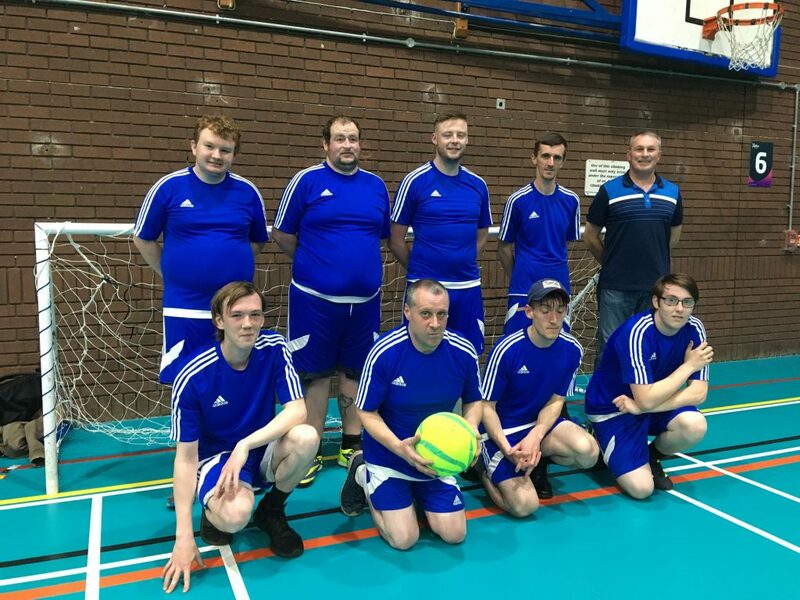 A project using football to support men in Chester who have experienced mental health difficulties has netted a funding boost. Chester FC Community Trust has been awarded a Magic Little Grant through the partnership between Local Giving and the Postcode Community Trust, a grant-giving charity funded entirely by players of People’s Postcode Lottery. Chester FC Community Trust, Forum Housing Association, Foundation Enterprises North West and the Cheshire Centre for Independent Living through the Get Yourself Active project work together to organise weekly football training sessions at the Northgate Arena and competitive fixtures in the Cheshire Ability Counts Football League. The project helps to reduce the social isolation that people with mental health problems can experience, offering them opportunities to make friends and keep fit in a familiar environment. As well as having physical health benefits, regular exercise has been shown to help improve people’s mental health and the sessions allow men to talk about their problems without stigma, seek advice and access support. Chester FC Community Trust has received a Magic Little Grant of £500 which will help towards the cost of facilities, equipment, coaches and transport to matches. Jim Green, chief executive of Chester FC Community Trust, said: “This is brilliant news and we’re very grateful to Local Giving and the Postcode Community Trust. “Football can have huge benefits and this project is making a real difference. Participants have a sense of belonging, are gaining confidence and increasing their physical and mental fitness. For more information about the Postcode Community Trust visit www.postcodecommunitytrust.org.uk and for further details about the People’s Postcode Lottery, including how to play and help to support more charities, go to www.postcodelottery.co.uk. Chester FC Community Trust has a host of opportunities for girls to play football during The FA Girls’ Football Week. Kicking off today and running until Sunday, The FA Girls’ Football Week is a national campaign to give even more girls the chance to get involved with the sport whether playing, training or simply learning more about the beautiful game. During the week, Chester FC Community Trust coaches will be visiting schools and delivering a range of sessions for girls of all ages to play football. Girls football continues to grow in popularity and Chester is well served with a number of fantastic grassroots clubs catering for girls of all ages including Chester & District Girls, AFC Waverton Girls and Upton JFC. For more information about The FA Girls’ Football Week and to search for your nearest session go to www.fagirlsfootballweek.com. The Chester FC Girls Advanced Player Development Centre (APDC) programme for 2017/18 launches with an assessment evening on the new 3G pitch at Blacon High School. Players continue to train and play for their grassroots club, but are invited onto a 20 week training programme that will challenge them in line with The FA’s four corner model and feature a minimum of two fixture festivals in conjunction with other APDCs. 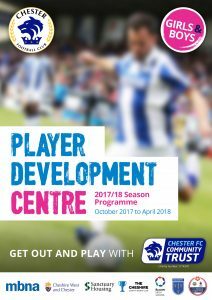 For more details about the programme email community@chesterfc.com or contact 07512 355396. Chester FC Community Trust coaches will be visiting Abbey Gate College in Saighton to deliver a football session to Year 7 girls. 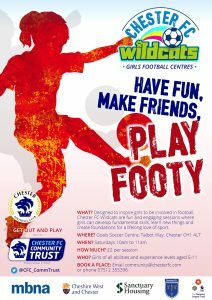 Chester FC Wildcats sessions run at Ellesmere Port Sports Village every Wednesday from 5pm to 6pm. Designed to inspire girls to be involved in football, Chester FC Wildcats provides fun and engaging sessions where girls can develop fundamental skills, learn new things and create foundations for a lifelong love of sport. Open to girls aged 5-11 of all abilities and levels of experience, the sessions cost just £2 per week and there are progression routes to community clubs for those girls who wish to play in matches. For more details or to book places email community@chesterfc.com or contact 07512 355396. Chester FC Community Trust coaches will be visiting Bunbury Aldersey C Of E Primary School to deliver two football sessions to girls in Years 1 & 6. Chester FC Community Trust coaches will be visiting Delamere Academy to deliver two football sessions to girls from across the school. Chester FC mascot Lupus will be visiting Lache Primary School to take part in a morning assembly before the school’s girls team’s cup match later that afternoon. Chester FC Wildcats sessions run at Goals Soccer Centre every Saturday from 10am to 11am. Want to know more? Email community@chesterfc.com or contact 07512 355396. 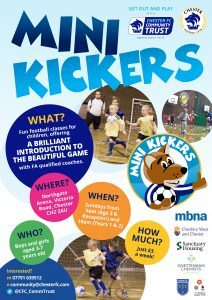 Chester FC Mini Kickers sessions take place every Sunday at the Northgate Arena for young children to learn and develop their footballing skills. Aimed at giving children good coaching in a safe and positive environment, the sessions offer a fun way of exercising and improving their skill for reception age children and those in Years 1 & 2. 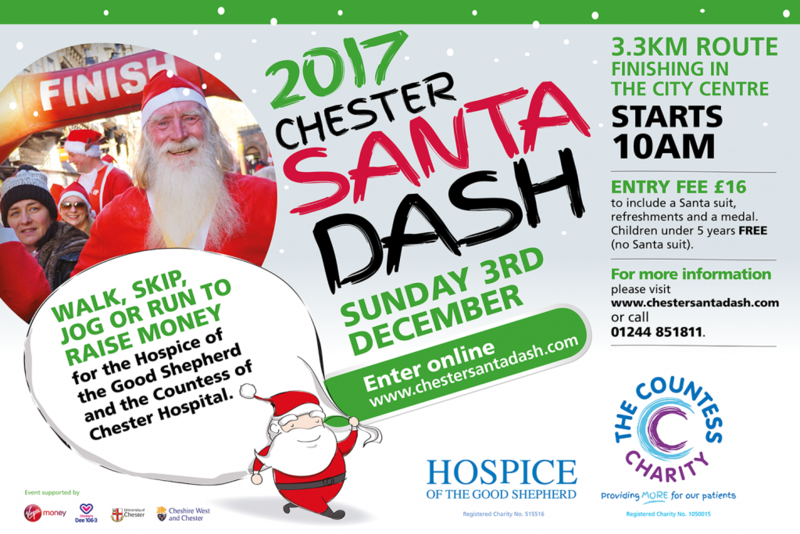 Chester FC Community Trust is supporting the Chester Santa Dash and encouraging Blues fans to get involved with the festive fundraiser. The annual event, which raises money for the Countess of Chester Hospital Charity and the Hospice of the Good Shepherd, takes place on Sunday, December 3rd. Lupus will be joining families at the start of the dash with the 3.3km route setting off from the Riverside Innovation Centre Building and taking in iconic Chester landmarks including including the Eastgate Clock, Chester Rows and Chester Cathedral before finishing on Bridge Street. This year there will be live bands performing Christmas songs along the route with some festive surprises. Entry costs £16 which includes a Santa suit, refreshments and Chester Santa Dash medal. Children under the age of five can take enter for free without a Santa suit. To enter or for more details go to www.chestersantadash.com or call 01244 851811.